Puzzle-based storage systems are a new type of automated storage systems that allow storage of unit loads (e.g. cars, pallets, boxes) in a rack on a very small footprint with individual accessibility of all loads. They resemble the famous 15-sliding tile puzzle. 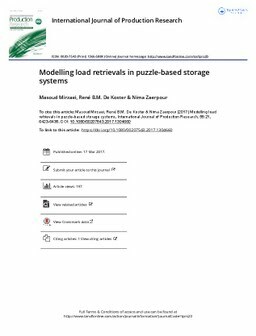 Current models for such systems study retrieving loads one at a time. However, much time can be saved by considering multiple retrieval loads simultaneously. We develop an optimal method to do this for two loads and heuristics for three or more loads. Optimal retrieval paths are constructed for multiple load retrieval, which consists of moving multiple loads first to an intermediary ‘joining location’. We find that, compared to individual retrieval, optimal dual load retrieval saves on average 17% move time, and savings from the heuristic is almost the same. For three loads, savings are 23% on average. A limitation of our method is that it is valid only for systems with a very high space utilisation, i.e. only one empty location is available. Future research should investigate retrieving multiple loads for systems with multiple empty slots.